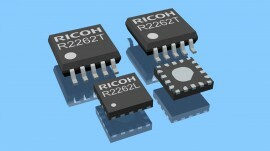 Ricoh Europe launches a new Real Time Clock IC, the R2262. This integrated circuit keeps track of accurate time and date at all times, and communicates with the processor by three signal lines. With three important functions incorporated in just one device, namely Real Time Clock, Backup Battery Switchover Circuit and Voltage Detector, the R2262 saves both on costs and board space. The device holds a Real Time Clock that even when the application is switched off, provides the application with current time and date information. In this case, the alternate source of power (back-up battery) supplies the RTC with power. The special built in Battery Backup Switchover function switches automatically between the main power and the backup power supply. The internal Voltage Detector controls the internal switches of the Switchover Circuit by identifying the absence of the main power supply and switching over to the backup battery. Additionally, the output of the Voltage Detector is connected to a pin. This can be used to provide a reset signal to the processor whenever the supply voltage drops below an internally preset level. Both the low supply current consumption of 0.30µA and the Minimum Time Keeping supply voltage of only 0.6V guarantee a long battery back-up period. The high precision oscillation adjustment circuit adjusts time counting with high precision and corrects clock deviations by adding or skipping clock pulses. The maximum remaining clock deviation is ±0.5ppm or ±1.5ppm, depending on register settings. As a result of this, the actual time and date are maintained at an outstanding high accuracy level. The R2262 has an interrupt circuit to generate interrupt signals ranging from 0.5 seconds to one month. Processor ICs are able to operate with a low sub-clock frequency in order to set the processor in an economic mode. By using the external 32kHz output frequency of the RTC IC, it is possible to save an additional crystal on the circuit board. The R2262 is available in two types of packages; standard version (T) and small version (L), making it very useable on high density and small circuit boards. New Power-Monitoring IC from MicrochipNeed a Low Power Solution Which Eliminates External Memory?